Otras temporadas: 72 horas antes de la llegada. Estacionamiento: podemos proporcionar facilidades de parqueo por US$15, impuesto de venta incluido a tres cuadras de la propiedad. Menores de edad: pagan como adulto. Se garantiza con tarjeta de crédito y se cancela el total del hospedaje al momento del check in. 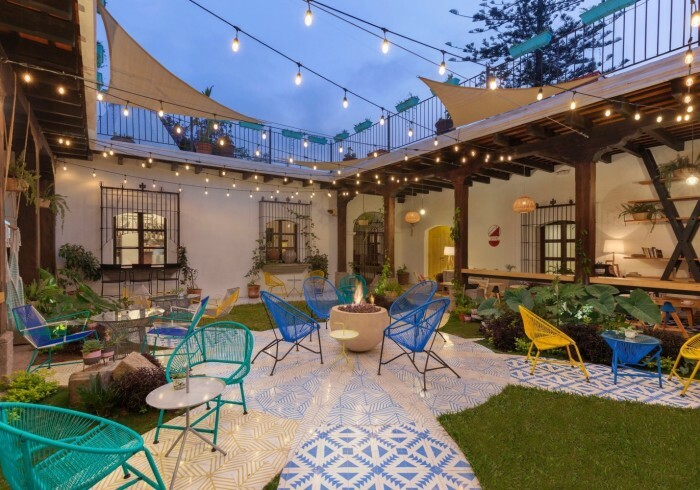 Situated in one of Antigua’s scenic colonial houses mere two blocks away from her main square, Adra strives to provide friendly and hospitable environment for weary travelers, restless artists and empty stomachs. The Arabic word “Adra” associates with the notion of pure, untainted beauty – something we take up as a guiding principle, serving our guests in an ecologically conscious ways, whether it is by using biodegradable materials and water-saving devices for hygiene, responsibly recycling our waste, or supplying our kitchen with strictly organic harvest food. Estufa Roja, the gourmet restaurant nested inside our hostel, houses two acclaimed chefs: Laurent Katgely, with rich experience in gastronomy brought from San Francisco, and Alan Fairhurst, a winner of several culinary awards. Our hostel also aspires to function as an open space for cultural activities, supporting local artists and fundraisers. We welcome enthusiastic minds who wish to share their passions by organizing workshops, throwing live performances or displaying their art. We also invite and encourage our guests and friends to participate in various volunteering projects around town. We invite you to have a pleasant stay in Antigua while helping us contribute our bit to the change we’re all hoping for.